We only stayed for one night, but all was excellent. The house is very peaceful and just opposite the beautiful abbey ruins. The room was large, all facilities worked, and breakfast was very fine. Absolutely wonderful. Peaceful, relaxing and beautiful surroundings. Highly recommended! The location of Abbey House was great! Breakfast was lovely. 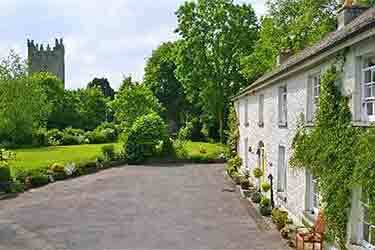 The Abbey House is beautiful and very conveniently located in County Kilkenny . The house and the property it sits on are lovely and very tranquil. We very much enjoyed our stay. Nice old and quiet house, uncomplicated stay, good breakfast. Ideally located right across the street from Jerpoint Abbey. Just a few minutes to Kilkenny by car. Nice landlady. Place was amazing. Great location, amazing hostess, great breakfast. Our stay at Abbey House was very nice. Enjoyed the lovely antiques. The setting right across the road from Jerepoint Abbey couldn't have been better. And Helen was delightful. We would definitely stay again. Lovely place to stay. Wonderful host who catered for all our needs. Our stay at the Abbey House B&B was magnificent. Everything from the setting to the welcome to the breakfast was 5star. I'd highly recommend the place. Without a doubt, the best breakfasts we had during our two-week travels around Ireland. Many thanks, Helen! Very enjoyable stay at Abbey House. Room was very comfortable and the breakfast was excellent. Helen was a very welcoming hostess. Would highly recommend a stay here if you are visiting the area. Convenient to Mount Juliet and Thomastown. Most beautiful place to stay even if it was very wet outside. Very friendly lady owner. Fantastic breakfast. Would highly recommend this great value..
Lovely and relaxing place to stay. Near to Thomastown. Better if you have a car. All the staff are friendly, Helen is a perfect host. Breakfast that we had there it was much better that the one we have had in 4 hotels. Room very clean, perhaps a bit cold at our arrival. Good choice for value. Sure we will come back. Abbey House was immaculate and charming. Helen was a delightful and helpful host. The breakfast was magnificent - fresh and wonderful choice. Could not recommend this place more highly. Helen, was a very friendly and accommodating hoast, enjoyed my stay here. We had wonderful stay at Abbey House B&B. The surroundings were lovely and we were able to sit outside and have some wine and enjoy the quiet refreshing after a long day of driving. The rooms were clean and comfortable and had everything you would need to feel at home.. Breakfast, which was plentiful and cooked to order, was excellent and served in the sunny dining room. Helen is a wonderful hostess and goes out of her way to make you comfortable. we would highly recommend the Abbey House we were looked after very well would definitely visit again. Excellent location, near Kilkenny. Very quiet with excellent breakfast. Fantastic location. The bed was not particularly comfortable, but acceptable. Breakfast service was cheerful. Very nice place to stay. Friendly host and more than comfortable rooms. Perfect spot, excellent food, very nice accomodations. Very pleased with this bed and breakfast. We stayed on a very cold stormy night and the rooms were delightfully cosy, yet full of period character that matched the setting perfectly. Helen was very accommodating, waiting up for our late arrival and cooking us a delicious breakfast to order the next morning. Absolutely stunning B&B with great rooms extremely comfortable beds with electric blankets!, lovely views and excellent breakfast. Would definitely recommend! We really enjoyed our stay at Abbey House - a really warm welcome. Nice cosy fire in the evening and wonderful breakfast in the morning with REAL freshly squeezed juice! I enjoyed staying at Abbey House B&B. The furniture and house were charming, and in keeping with the history of the place, while still having modern conveniences. Jerpoint Abbey was right across the road, and the old Mill on the premises is worth exploring on its own. Helen was kind, and her breakfasts tasty and prettily presented. We stayed there two nights, and will want to return on our next visit to Ireland. The Finest in Kilkenny! Had a great time, albeit short. The breakfast was delicious, the grounds beautiful, and in a great location! Thank you for our great stay! It was one of the best stays we had on our recent trip to Ireland. Helen was a dear and the location of her B&B was perfect. Her Irish breakfast was very good, too. I would highly recommend Abbey House. This B&B was clean and cozy, and the owners were quite friendly and helpful. It is located in the quiet town of Thomastown, which is lovely during the day. However, it was a bit further from the main town of Kilkenny than we had thought when we booked it. The nicer pubs and restaurants are in Kilkenny, so we found ourselves driving more than we wanted to. But it was still a great choice for us. What a nice stay my sister and I had at the Abbey House. Lovely twin room with nice view of the grounds and across to the Abbey. Breakfast had a great range of cereals, yogurt, fruit etc and then a super choice of hot dishes. Friendly and helpful we will definitely go back next trip to Kilkenny/ Thomastown area. The hostess and her staff were nothing but delightful. The rooms were lovely, and the breakfast was superb. We would definitely stay at Abbey House again in the future. WE ENJOYED OUR STAY VERY MUCH, IT WAS CLEAN & COMFORTABLE & RELAXING. We stayed at Abbey House for 3 nights during a 3-week stay in Ireland in June-July 2013. Abbey House was our favorite of the 7 B&Bs we used. It is a beautiful Irish country home, in a serene and lovely location, right across the road from Jerpoint Abbey. Our room had a picturesque view of the ruins of a mill, right behind the house. Helen is a gracious hostess, and her breakfasts were wonderful. There is a beautiful and spacious family room and sun porch for the use of guests. We found the location just right as a base for exploring south east Ireland. We could easily explore a different location each day, and took in Waterford & Wexford, Kilkenny, Cashel and Cahir. If you want a quiet and comfortable stay, without the noise of a city out your window, this is perfect. It was our last B&B before flying out of Dublin, and is an easy drive to the airport, if your flight is not too early. Abbey house is in a beautiful setting in Ireland. They have beautiful gardens, a steam and an old ruin of a mill in the back, lots of large trees. across the street in an old abbey you can tour which we enjoyed very much. Helen, the hostess, was very accommodating, and served us scones and tea when we arrived. The next morning we had French toast for breakfast which was terrific- she actually has a menu that you can order from. Our room and bath were very nice; all in all I would give Abbey House an A plus rating. Abbey House was a great location for exploration of Jerpoint Abbey, Kilkenny and other local points interest. Our group of three was comfortably accommodated, and very much appreciated our hosts' suggestions for dining and exploring. Many will enjoy the scenic location, the adjacent former-mill property and stream, the property's own history, and its memorabilia and antiques. A very enjoyable stay, with a very personal touch. A beautiful country house with lots of history. A lovely home, good food, great location, and affable hosts. What more could one want as an introduction to Ireland our first 2 nights. Highly recommend this B&B. We certainly enjoyed our stay at the Abbey House. Lovely old house with beautiful grounds on the river. Nice big rooms. Good breakfasts. In a very pretty area across from the ruins of an old abbey. Une maison trÃ¨s accueillante dans un environnement magnifique. Petit-dÃ©jeuner parfait. Mais il faut prendre la voiture pour aller dÃ®ner dans la ville toute proche. We had a lovely stay in Abbey House, and couldn't recommend them highly enough. We recieved a very warm, welcome all our needs catered for. Delighted with our sate and will definately be back! !